Ye heavenly Birds! To your Progenitors." "A huge sea of verdure with crossing and interesting promonteries of massive and tufted groves,… tenanted by numberless flocks and herds, which seem to wander unrestrained, and unbounded, through rich pastures. The Thames, here turretted with villas and there garlanded with forests, moved on slowly and placidly, like the mighty monarch of the scene, to whom all its other beauties were accessories, and bore on his bosom a hundred barks and skiffs, whose white sails and gaily fluttering pennons gave life to the whole." Practitioners in the field of the visual arts were never slow to make use of the view in their work. Some of these artists were, in fact, resident locally in Richmond and its vicinity. Such a man was Augustin Heckel (1690 to 1770), a German-born artist resident in Richmond from 1746 until his death. 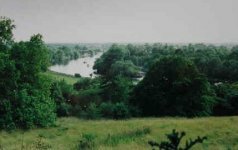 His View from Richmond Hill up the river became widely known after being engraved by Grignion. The same view was also painted by Joseph Farington (1747 to 1821) and engraved by J.C. Stadler. Sir Joshua Reynolds (1732 to 1792), a painter not principally known for his landscapes, had an excellent view of the vale from the rear of his house, Wick House, on Richmond Hill. He painted the scene in about 1780.
" a large and important work…in which that favourite national scene of ours is treated with a most circumstantial fidelity and completeness of detail and, at the same time, with refined poetical feeling and brilliancy of effect which we have so often admired in the much varied productions of that artist." One of the greatest of all English landscape painters, J.M.W. Turner (1775 to 1851) – who, for a time, had a country residence in Twickenham – exhibited his England: Richmond Hill on the Prince Regent’s Birthday at the Royal Academy in 1819. This painting now hangs in the Tate Gallery, London. Another artist who lived in the area and who did many paintings of the locality, including the Richmond Hill view, was Thomas Christopher Hofland (1777 to 1843), husband of the writer Barbara Hofland. The attraction to artists of the view from the Hill has not diminished in recent times. In 1926, whilst he was staying in England, the Austrian-born artist, Oskar Kokoschka (1886 to 1980) painted Richmond Terrace, perhaps the most notable evocation of the scene by a contemporary painter.